Image caption Adobe has repeated a desire to "move away" from Apple products. Adobe has posted a short response to the letter Apple boss Steve Jobs has written about Flash technology. In it, Adobe said the legal terms Apple imposed on software developers had led it to shift its focus away from Apple. Mr Jobs used the open letter to defend Apple's decision not to allow Flash on many of the firm's products. In it he criticised Flash, saying it was not fit for an era of smartphones and touchscreen devices. Kevin Lynch, Adobe's chief technology officer, wrote in a blog posting: "We feel confident that were Apple and Adobe to work together as we are with a number of other partners, we could provide a terrific experience with Flash on the iPhone, iPad and iPod touch." 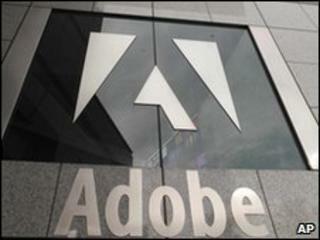 Image caption Adobe will concentrate on Android and other devices. Currently, none of these products can run the Flash technology which is used on many websites to power media players, games and other animations. However, added Mr Lynch, Adobe has decided to shift its focus to get Flash working well on gadgets made by Google, RIM, Palm, Microsoft, Nokia and others. He said Adobe expected to release Flash Player 10.1 on Google's Android operating system in May and then for it to be on general release in June. "From that point on," he wrote, "an ever increasing number and variety of powerful, Flash-enabled devices will be arriving which we hope will provide a great landscape of choice." The letter came soon after Adobe announced it would stop making tools that allow developers to quickly translate Flash code to run on Apple gadgets. Other Adobe executives have commented on Mr Jobs' letter. Adobe CEO Shantanu Narayen told the Wall Street Journal (WSJ) that "when you resort to licensing language" to restrict development, it has "nothing to do with technology". Mr Narayen said the problems highlighted by Mr Jobs were "a smokescreen". He added that if Flash crashed Apple products it was something "to do with the Apple operating system". "We have different views of the world," Mr Narayan told the Wall Street Journal. "Our view of the world is multi-platform." In an editorial on OS News, Tom Holwerda said Mr Jobs' letter was "hypocritical" because Apple was guilty of many of the faults it levelled at Adobe.